Ever have one of those days where you feel like crap? You know, like nothing in particular is wrong but you just feel…off? Me too. About every other month, I’m in need of a mental health day. A day where I intentionally take things at a slower pace and do the bare minimum. These days differ from my typical Sunday “relax days” where I don’t work and take a 20 minute shower before slathering myself in coconut oil and binge watching Sister Wives. These crap days are when my ability to focus, work efficiently and generally care is diminished. There are literally hundreds of thousands of articles published on what to do on these days. I’ve tried many different things to get through these days, and I don’t have a one-size-fits-all remedy for the feelings of disappointment, frustration, and dismay that can come up on days like this. I do, however, keep a list of things I can do to make me feel better and I’ve compiled them here. Breaking these ways down into mental, physical and spiritual categories ensures that all needs are met. Make a to do list for the day. This can be as detailed as brushing your teeth and feeding the cat. Just the necessities for today! Focus on the next 5 minutes. Allow yourself to take today slowly – we all need mental health days. Shower. 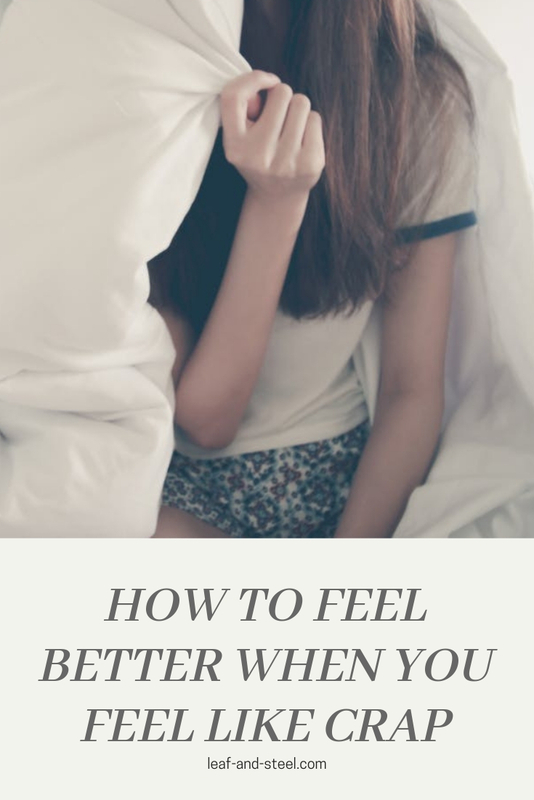 You’ll feel instantly better. Eat a healthy snack. I like almonds, peanut butter on rice cakes or celery, apples and granola. It’s important to put down the salty, crunchy, fatty or sugary snacks in order to feel better faster. Drink water. I know I am prone to sluggishness, irritability, and depression when I’m dehydrated! Signs of dehydration include thirst, hunger (surprisingly), dry skin and lips, and dark colored urine. Follow the 20-20-20 rule. I always, always have increased energy and optimism after a 20 minute nap, a 20 minute walk and a 20 minute shower! Use essential oils in a diffuser. I prefer lavender diluted with water. As far as oil, I like this one from Mary Taylor Naturals ($14.95 from Amazon). It comes with a convenient dropper. This is the diffuser I use – I received it as a gift and I love it because of the many timing options ($24.99 from Amazon). Pray. Talk. Send out good vibes. This one is open to interpretation, you don’t have to get on your knees for this. Sometimes, just putting my worries and fears out into the universe helps calm me. Meditate. Even for 5 minutes. This is proven to lower blood pressure and boost mood. Make a gratitude list. I have a post on how to do that here. I hope this provides some ideas for those days when you feel like absolute crap. What do you do on these days? Have you ever tried any of the ideas above?